I found this recipe here. I did not follow the recipe exactly. For the topping I only added sugar and no lemon zest. These are really good. They are very fluffy muffins loaded with blueberries. First, make the topping. In a small bowl, stir together the sugar and lemon zest. Set aside and use right before baking the muffins. Next, the muffins. Preheat your oven to 425 degrees F.
Place muffin/cupcake liners in the muffin pan or spray the pan with nonstick cooking spray. Next, in a small saucepan over medium heat, bring 1 cup of blueberries and 1 teaspoon of sugar to simmer. Cook the mixture, mash the berries with a spoon and stirring frequently. Cook until the berries have been broken down and the mixture is thickened. It should be reduced to ¼ cup. Cook for about 6 minutes. Transfer the mixture to a small bowl and cool to room temperature, about 10 to 15 minutes. Then in a large bowl, whisk together the flour, baking powder, and salt. Then, divide the batter equally among the muffin tins (the batter should completely fill the tins and mound slightly). Put 1 teaspoon of the cooked blueberry mixture into the center of each mound of batter. Use a toothpick to gently swirl the berry filling into the batter. I then sprinkled a few blueberries on top of each muffin. Sprinkle the tops of each muffin with the lemon sugar topping. Finally, Bake until the tops of the muffin are golden and firm, 17 to 19 minutes. Rotate the muffins halfway through the baking time. Cool the muffins in the pan for 5 minutes and then transfer to wire rack and cool 5 minutes before serving. kml9876 : Thanks. I tried to follow the recipe exactly. They looked amazing and tasted great! 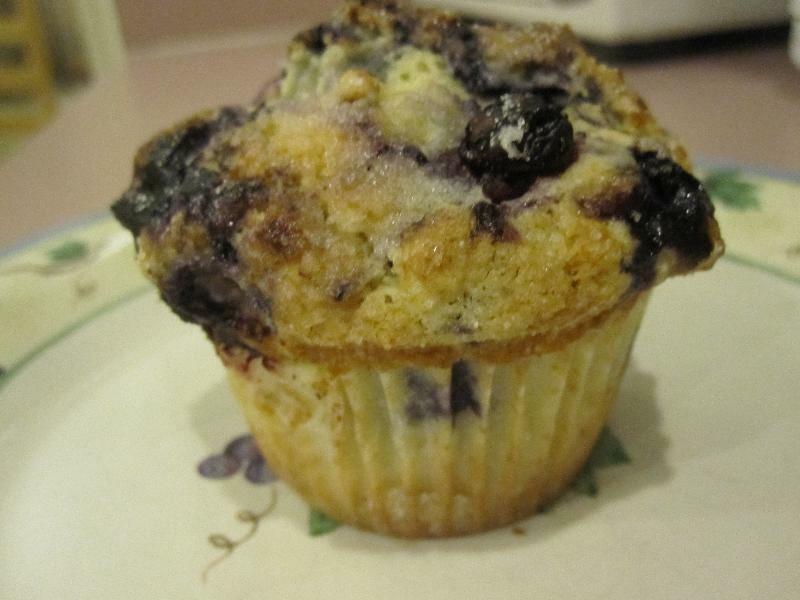 anonymous : I went to the website where you found this recipe and your muffin looks just like the one they made! Can't wait to try these!